Is this game a RPG? Is it a puzzler? Actually it's both, bringing to mind memories of the ace Puzzle Quest (by the way; Puzzle Quest 2 out on X-Box Live Arcade next Wednesday!) A friend of mine recommended I get this game as she loved it. So I did. Recently completed it, and recently discovered a HD version is coming out on X-Box Live Arcade. The game starts with you a bunch of Humans and Elves meeting in some woods. Demons unexpectedly turn up and kill everyone. Everyone apart from a handful of young teens who mostly escape via a malfunctioning teleporter that teleports them to random locations in the world. Each level sees you in the role of one of these teens. Starting off with the female Elf you discover that the Demons have orchestrated the slaughter to create war between Humans and Elf's. Each character has their own little storyline that fits into the overall one of Demons trying to take over the world. The Knight for instance has been declared a rebel, and so must sneak into his City and convince the King otherwise, while the Knights sister finds herself not only teleported to the realm of the Necromancers, but also discovers she has died and is now a ghost! The game for the most part is Fantasy, not Horror. Well to be honest for the whole part the game is Fantasy. It's going to be really hard for me to describe how this game works. 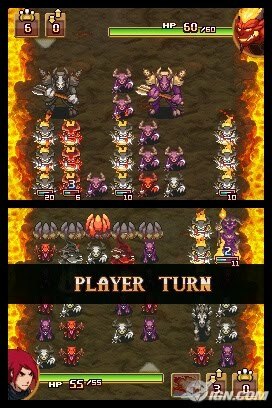 The top screen shows the enemies troops. The bottom screen shows your troops. The aim of most the battles is to use your troops to attack the enemies health bar. To do this you must first defeat any enemy troops in the way. Different units have different attack charge times, and powers. line up 3 troops of 1 type together vertically and they will go into attack mode. Line them up horizontally and they will turn into a defensive structure whether it be vines, or gold walls. More special troops require either 2 normal troops to charge them up, or 4 for the really strong units such as Titans from the Persian Style troops, to Angels of the Knights troops. All are in limited supply. Each level sees you in a map with several things you can do. 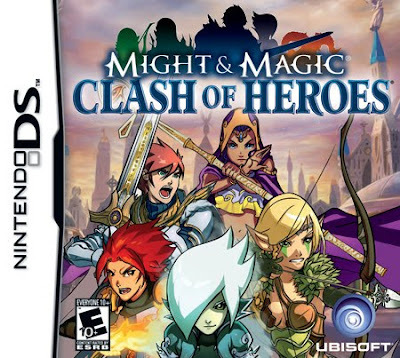 Characters with a silver sword above them are optional fights. Characters with a gold sword above them are quest related fights. Characters with question marks above their heads either can be spoken to, or challenged to fight. Each fight you win gives you experience points, as well as gold (that can be used to replenish troops). Also in the levels are treasure chests that usually hold special items (1 special item can be equipped at a time, they give you battle stat boosts), and Hunters who provide much of the games optional bonus missions. Lastly there are puzzle quests in which you have a chess style one move problem to solve. It is the third and fourth levels that earn the game its place on The Rotting Zombie. 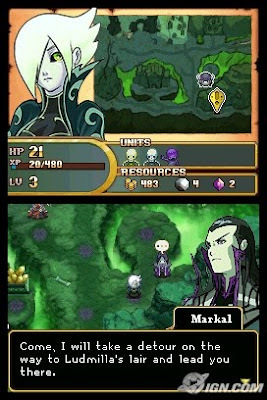 The third level sees you in the land of the Necromancers as a ghost. Troops you recruit include Skeletons, as well as...Zombies! Heh, love the zombies. The whole land of the dead is great, all cartoony gloom, and gravestones. The fourth level is set in the Demon realm with a boy who finds he has the power to control Demons. The Demons are portrayed as comedic and cartoon bad, the Demon Pub in particular is a very fun place due to the music, and comedy dialogue. The game does have some faults. Random encounters can be frustrating when you are being attacked by enemies stronger than yours. Defeat holds no penalty which is good, but if you decide rather than waste 5 to 10 minutes in a fight you cannot win you instead escape the battle then you get heavily penalised, loosing lots of gold. The level caps are quite low. Troops can level up to level 5, while the main characters can level to 10 meaning towards the end of each level the random battles etc serve no purpose other than to irritate. The review has been terrible, I apologise, but if you want a RPG/Puzzler of a decent length (around 30 hours) then get this! Or better still, buy it when it comes out in HD on the home consoles!